Tottenham Hotspur v Manchester City H.L. Spurs (4-3-3): Lloris (c), Walker, Alderweireld, Vertonghen, Rose; Eriksen, Wanyama, Alli (Nkoudou 85); Sissoko (Dier 71), Son (Janssen 90), Lamela. Substitutes (not used): Vorm, Trippier, Davies, Winks. Manchester City (4-2-3-1): Bravo, Zabaleta (c), Otamendi, Stones, Kolarov; Fernandinho, Fernando (Gundogan 53), Navas (Iheanacho 65), Silva, Sterling (Sane 87); Aguero. Substitutes (not used): Caballero, Sagna, Clichy, A Garcia. West Bromwich Albion v Tottenham Hotspur H.L. Spurs (4-1-4-1): Lloris (c); Walker, Alderweireld (Dier 60), Vertonghen, Davies; Wanyama; Sissoko (Dembele 64), Eriksen, Alli, Lamela (Son 72); Janssen. Substitutes (not used): Vorm, Trippier, Nkoudou, Onomah. West Brom (4-4-1-1): Foster; Nyom, Dawson, McAuley, Evans; Phillips (Brunt 68), Fletcher (c), Yacob, McClean; Chadli (Gardner 87); Rondon. Substitutes (not used): Myhill, Olsson, Robson-Kanu, Morrison, Leko. Bayer Leverkusen v Tottenham Hotspur H.L. Bayer Leverkusen (4-2-3-1): Leno, Bender (c, Jedvaj 73), Tah, Toprak, Henrichs; Aranguiz, Kampl; Mehmedi, Hernandez (Brandt 85), Calhanoglu (Baumgartlinger 46); Kiessling. Substitutes (not used): Ozcan, Dragovic, Havertz, Volland. Spurs (4-1-4-1): Lloris (c); Trippier, Dier, Vertonghen, Rose; Wanyama; Lamela (Sissoko 71), Eriksen, Alli, Son (Onomah 90); Janssen (Dembele 64). Substitutes (not used): Vorm, Carter-Vickers, Davies, Winks. AFC Bournemouth v Tottenham Hotspur H.L. AFC Bournemouth (4-2-3-1): Boruc; Smith, Francis (c), Cook, Daniels; Gosling, Arter; Ibe (Gradel 60), Wilshere, King (Fraser 88); Wilson (Afobe 82). Substitutes (not used): Federici, Ake, Mings, Mousset. Spurs (4-2-3-1): Lloris (c); Walker, Dier, Vertonghen, Rose; Wanyama, Dembele, Eriksen, Alli (Sissoko 71), Lamela; Son (Janssen 61). Substitutes (not used): Vorm, Trippier, Wimmer, Davies, Winks. Pochettino: "I played when I was 17, it is cultural. "If Marcus Edwards were born in Brazil or Argentina, he would be one of the most interesting prospects in world football." "Maybe all the big teams would be fighting to buy him, but he is at Spurs, he is in England and at 17 he is still a kid." "We cannot appreciate he is a man, nearly a man, and he deserves to play." "But that is the cultural difference and the Premier League is one of the stronger financial leagues." "Spurs, like all the clubs, prefer to buy experience and quality rather than give time to the younger players." "They bring a player who is 23, 24 or 26 that performs quickly, not wait and build a prospect like Marcus Edwards. Liverpool v Tottenham Hotspur H.L. Liverpool (4-3-3): Mignolet; Alexander-Arnold (Clyne 68), Lucas (c), Klavan, Moreno; Stewart, Grujic (Can 89), Ejaria, Wijnaldum; Origi (Ings 68), Sturridge. Substitutes (not used): Karius, Lovren, Lallana, Mane. Spurs (4-2-3-1): Vorm; Trippier, Carter-Vickers, Wimmer, Davies; Dier (c) (Wanyama 67), Winks; Onomah, Carroll (Lamela 61), Nkoudou (Harrison 83); Janssen. Substitutes (not used): Lopez, Walkes, Vertonghen, Amos. THFC team: Lloris (C); Walker, Dier, Vertonghen, Rose; Dembele, Wanyama; Eriksen, Dele, Son; Janssen. Subs: Vorm, Trippier, Davies, Carter-Vickers, Winks, Onomah, Nkoudou. Subs: Zieler, Hernández, Albrighton, Amartey, Schlupp, Gray, Ulloa. Tottenham Hotspur v Leicester City H.L. Spurs (4-2-3-1): Lloris (c); Walker, Dier, Vertonghen, Rose; Dembele, Wanyama (Winks 87); Eriksen, Alli (Nkoudou 83), Son; Janssen. Substitutes (not used): Vorm, Trippier, Davies, Carter-Vickers, Onomah. Leicester (4-3-2-1): Schmeichel; Simpson, Huth, Morgan (c), Fuchs; Mahrez (Albrighton 72), Drinkwater, King; Musa (Schlupp 68), Okazaki (Ulloa 78); Vardy. Substitutes (not used): Zieler, Hernandez, Gray, Amartey. Yellow cards: Spurs – Rose, Son, Wanyama; Leicester – Mahrez, Musa, Vardy, Simpson. Tottenham Hotspur v Bayer Leverkusen H.L. team: Lloris (C), Walker, Vertonghen, Wimmer, Rose, Dier, Wanyama, Dembele, Eriksen, Son, Kane. Arsenal v Tottenham Hotspur H.L. Arsenal (4-2-3-1): Cech; Bellerin, Koscielny (c), Mustafi, Monreal; Xhaka, Coquelin (Ramsey 64); Walcott (Oxlade-Chamberlain 70), Ozil, Iwobi (Giroud 70); Sanchez. Substitutes (not used): Ospina, Gabriel, Gibbs, Elneny. Spurs (3-5-2): Lloris (c); Dier, Wimmer, Vertonghen; Walker (Trippier 80), Wanyama, Eriksen, Dembele, Rose; Son (Winks 89), Kane (Janssen 73). Substitutes (not used): Vorm, Carter-Vickers, N’Koudou, Onomah. team: Lloris (c), Walker, Dier, Vertonghen, Rose; Wanyama, Dembele, Winks, Eriksen, Kane, Janssen. Subs: Vorm, Carter-Vickers, Trippier, Wimmer, Alli, Onomah, Son. 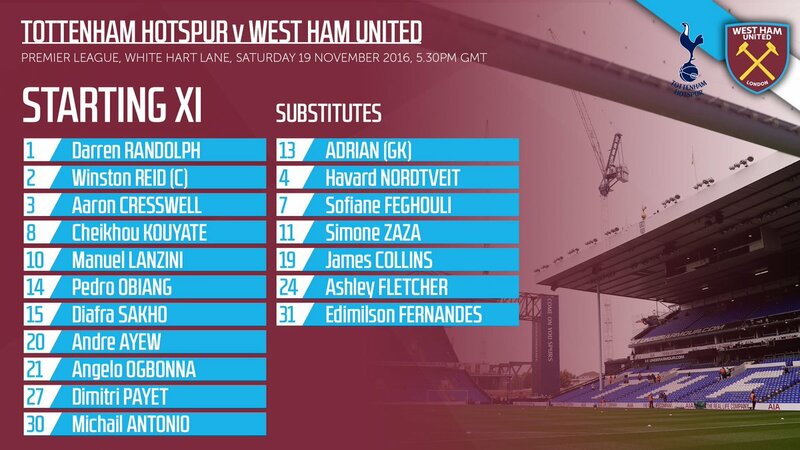 Tottenham Hotspur v West Ham United H.L. Monaco v Tottenham Hotspur H.L. Monaco (4-3-3): Subasic; Sidibe, Glik, Jemerson, Mendy; Fabinho, Bakayoko, Lemar (Moutinho 81); Bernardo Silva, Falcao (c, Raggi 89), Germain (Carrillo 77). Substitutes (not used): De Sanctis, Boschilia, Mbappe, Diallo. Spurs: Lloris (c); Trippier, Dier, Wimmer, Rose; Wanyama, Dembele (Eriksen 64), Alli, Winks (Sissoko 74), Son (Janssen 64); Kane. Substitutes (not used): Vorm, Walker, Vertonghen, Nkoudou.